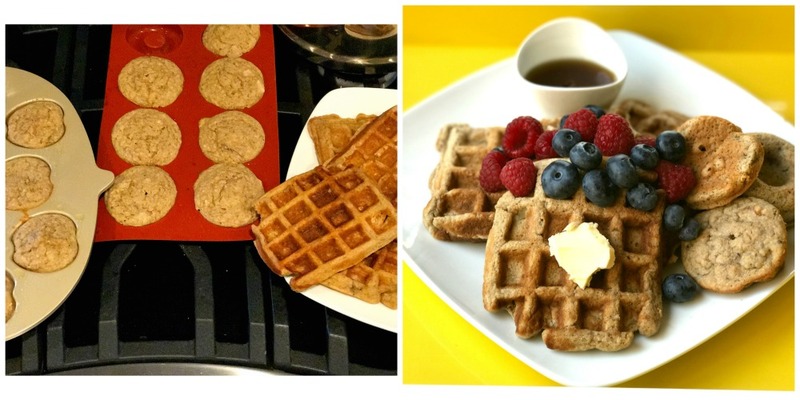 Home » Recipes » Gluten Free » Tiger Nut Flour Waffles, Pancakes & Muffin Bake-Fest! Tiger nuts have begun to make a name as a new superfood. Tiger nuts aren’t actually nuts at all! They are tubers, growths at the end of a root that stores energy for the plant. Small but mighty, they contain digestive-boosting fiber, as well as magnesium and potassium (1). Magnesium is critical in many functions of the body, including helping control blood glucose, synthesizing DNA, and regulating blood pressure (2). Potassium helps nerves function properly and muscles contract (3). 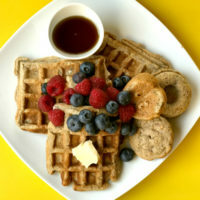 Tiger nut flour makes a great addition to these nutrient-packed waffles. They have that healthy whole-grain nutty flavor but with a smooth texture. Bonus: the batter also works for pancakes, muffins, or those fun little silicone cake molds. Top with your favorite fruit, a dollop of Greek yogurt, and a few walnuts for a super delicious anytime meal. ¼ cup canola oil – if concerned about GMOs, purchase non-GMO or organic canola oil. Mix together the oat flour, nut flour, baking powder, guar gum, salt, cinnamon, nutmeg, and sugar in a large bowl. Whisk eggs in a separate bowl. Mix in bananas, soy milk, canola oil, and vanilla extract. Stir wet ingredients into the dry ingredients. Add walnuts and stir until batter is smooth. Cook in a waffle iron for waffles, bake in muffin tin for muffins, or drizzle on the griddle for pancakes! Use coconut oil spray for a flavor boost. Top with fruit, yogurt, walnuts, cinnamon and syrup. « How Much Water Do You Need? Comment on Tiger Nut Flour Waffles, Pancakes & Muffin Bake-Fest!